the Special, the Minex and the Patent - the last in Sherwood, Club and Miniature Match guises. The"Special" was offered solely in .22 rimfire calibre. It was marketed as a target rifle for the exceedingly reasonable price of three pounds Sterling in basic trim with a windage adjustable tangent rear-sight. It would not be unreasonable to assume that it was intended sell competitively against the BSA and W.W. Greener products of the day. In fact, it was more than a match, in both handling and accuracy for the War Office Pattern miniature rifle although, in fairness, that bolt-actioned rifle was as much intended to provide a training rifle vaguely representative of the .303 calibre Lee-Enfield service rifle, ( the S.M.L.E. or Short Magazine Lee-Enfield), as to present the Nation or Commonwealth with a super accurate target rifle. 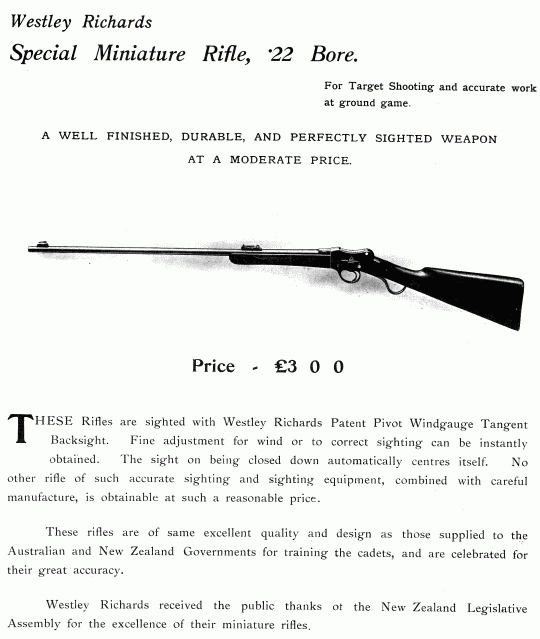 The War Office Pattern miniature rifle sold for ten shillings less at that time; (i.e. £2.50 against the £3.00 of the Westley Richards). 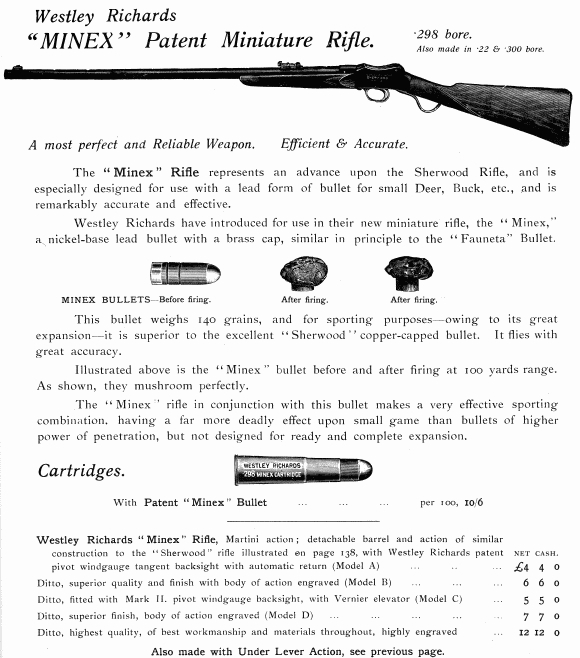 The "Minex", shown below, whilst also available in .22 rimfire and .300 Sherwood centre-fire "rook and rabbit" calibre, was largely marketed as a small game sporting rifle, with its specialised .298 calibre cartridge loaded with a Minex expanding bullet. In this configuration the rifle really falls outside our remit, but we have included the model because it was also available in .22RF and was, in the offered calibres, a miniature rifle that could well have been used for target work. 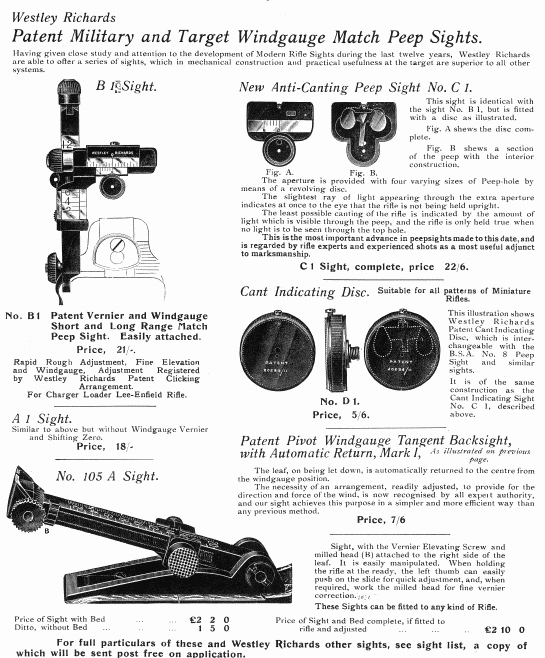 The Patent model, shown below, was a "take-down" version similar to those of two contemporary manufacturers; the BSA Model No.6 and the W.W. Greener take-down TARGET RIFLES . This option permitted easy removal of the barrel to facilitate portability. The rifles, so dissassembled, would fit into a small shot-gun style carrying case, little bigger than a large brief-case. Unlike the Birmingham Small Arms Company and Greener designs, which each utilised their own method of clamping action on the barrel breeching threads, the Westley Richards system was, almost literally, a "bayonet fixing" in effect. In that period, the equivalently specified rifles of these manufacturers sold, no doubt necessarily, at very similar prices. It is unclear what action was used for this rifle, unless you know different, but the "works" appear to be held into the body by a forward lug and the falling block fulcrum pin, much along the lines of a full-bore Martini-Henry action. Westley Richards produced their own range of sights, those above destined for sporting or target use. The folding aperture rear-sight is a cross between a Lyman sporting sight and the BSA and Greener equivalents. Around the same time, Greener's S714 rear-sight was selling for a mere 7/6d (37.5pence) - close to a third of the one pound, 2 shillings and sixpence (£1.12) which was asked for the Westley Richards' product. 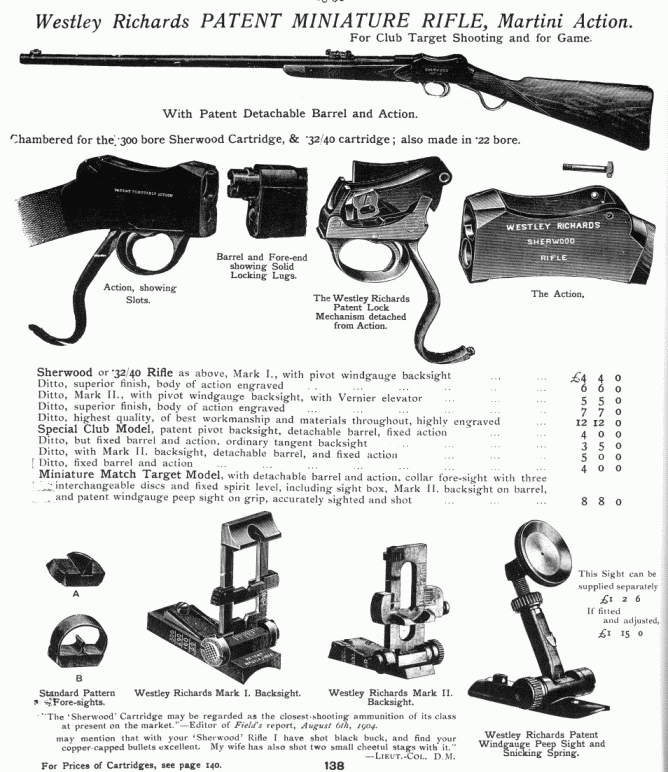 The standard BSA No.8 folding rear-sight came in at 9/6 - nine shillings and sixpence (47.5p). Below are shown two designs unusual for the day; one a full-bore anti-cant aperture and the other a miniature rifle shooting cant indicating aperture. The former is certainly intended for the prevention of any cant, whilst it is possible that the latter could have been used either for that purpose or, indeed, to permit a consistent cant as nowadays often employed by small-bore target shooters. This latter is specifically announced as being compatible with that aforementioned very popular BSA No.8 folding rear-sight.